Towards the end of 2009 I was passing through Fairfield for the first time in a number of years and, seeing a small flock of blue, maroon and grey 'galahs' dart across the Horsley Drive in a death-defying flight from school, I felt a sudden compulsion to drop in. 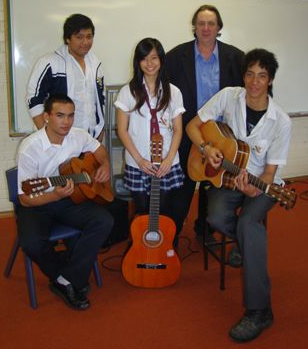 With music students at Fairfield High School, March 2010. I have lots of incidental memories of my years at Fairfield Boys' High School (1967-72) and yet when I came to write them down I realised that most of them are probably unprintable! I'm sure that says as much about how memory works as it does about what we actually got up to; we were a spirited bunch and being intensely interested in our studies did not prevent us from mucking-about. I remember one occasion when, while waiting for a teacher to arrive before we could be admitted to a classroom, we were playing a game of 'catch-it-if-you-dare-and pass-it-on' with a quickly disintegrating apple pie. As luck would have it, the teacher rounded the corner and coped it fair-and-square as a classmate deftly dodged my finely executed lob. Clearly unimpressed and unable to see the funny side led to me getting six cuts of the cane across the hands. While we tried to avoid it if we could, as boys, we knew that subjecting us to corporal punishment was indeed authority's admission of defeat, so we took it like the men we imagined we were. I was the school's pianist and things got a little serious when I had to play in assembly and I still couldn't feel my now swollen fingers. Defiantly, I borrowed motor-cycle gloves and proceeded to 'cluster' my way through God Save Our Gracious Queen and All Fairfield boys are moaning, hear now their voices groaning; 'moaning' and 'groaning' being our traditional substitutes for 'singing' and 'ringing', respectively. Why Fairfield Boys were vocalising anything to the tune of Scotland The Brave was as mysterious then as it is now. Perhaps it was a civic aspiration that, despite our location on the edge of civilisation (Sydney! ), and that many of the boys were children of European immigrants, we should all aspire to being good British subjects. In those years the Boys' and Girls' Schools were separate – divided roughly by the shared auditorium and the tennis courts, which today are still where they were then, although the gym has since migrated roughly from where L-block is today. Opposite the auditorium, roughly where D-block is, was a row of classrooms with the library at the end pointing towards the oval. Many an un-airconditoned summer afternoon was spend gazing out of those windows in anticipation of the occasional passing of girls: those mysterious creatures from beyond-the-gym. As their uniforms of the period were creping above the knees, our awakenings were more awoke! In any event, they were an increasingly welcome distraction from Euclidian geometry and the grammatical parsing of tricky English sentences. Many science classes were periods of keen learning, as the precocious budding physicists who build electronics for a hobby emboldened us all to argue logically with our teachers. To escape the authoritarian regime of the school into a world where the use of logic in an argument puts everyone on the same level, was as powerful a method of learning then as it was in Ancient Greece, and still is today. Those teachers who engaged us on this level earned a lot of respect. One such teacher was famous for his accurate chalk-throwing ability, which he called into service to encourage us to keep our minds on the job. Our discussions of experiments that didn't work as they were supposed to; of frozen rats, electrified frogs and explosions that just didn't; taught us more about the physical sciences, and about how to interpret empirical results, than any textbook ever could. The flux between respect and authority was never far from centre stage and always keenly interpreted by us as maturing adolescents. Looking back, those male teachers who were still young enough in spirit to remember, willing to engage, and committed to exploiting the learning opportunities afforded by our prankish behaviour, were able to elicit a level of academic performance that exceeded all expectations, including our own. Such a commitment was not restricted to our male teachers however. I clearly remember the day when a new, somewhat dumpy middle-aged female English teacher ushered us into a classroom for the first time, amid general mutterings of disappointment that we weren't lucky enough to get the alternative younger and more attractive teacher. Yet within the space of a couple of weeks, in which the dramatically different worlds of several authors from Shakespeare to T.S. Eliot were revealed, we realised we were the lucky class. This awakening interest in a mindful life went hand-in-hand with a desire to perform, from the annual musical and orchestral concerts to full-length plays; all done outside of class-time and with the commitment and encouragement of teachers from both schools. We were so pleased with collaborating and performing together than many of us returned the year after we matriculated, to stage Shakespeare's King Lear, for which I composed a ninety-minute all-electronic musical soundscape–a rather radical idea at the time. Since leaving our school I have studied and worked in the some of the best universities in the world and have taught and been challenged by students on every continent. Some went to privileged schools, some bought books instead of shoes; some were given grand pianos, others made their own musical instruments from box wood and old bicycle spokes. In the end, while good equipment clearly helps, I have never seen it be of much use unless it is accompanied by desire for knowledge and a willingness to practice skilful action. I have known students who were incredibly bright but for some reason or another, didn't find a reason to want to learn and who ended up in dissatisfying menial jobs. I have known students who worked diligently at their studies because that is what was expected of them. But I remember the often aberrant hotheads who argued with everyone, often performed erratically but who were searching for ways to make a contribution to the world. Education is a key to unlocking more possibilities than any other way known. So whilst, as human beings, no one type is any better or worse than another, those who don't find a way to meaningfully engage in learning miss out on a truly fulfilling life. I was fortunate to find teachers who cared enough to encourage me to pursue my interests and challenged me to understand how these interested were connected to different ideas and people in other worlds. I am often reminded how fantastic a gift that was. But it began with an internal desire born from a curiosity and not imposed by someone else. I'm sure that still today, the teachers at our school want to encourage you to build for yourselves rich and meaningful lives; to experience wider horizons. For what it's worth, my tip is "stay curious!"